The Nationals, perennial contenders of late, have succeeded with a balanced approach, which has included trading prospects for big league pieces. Over the last two years, they've dealt Lucas Giolito, Reynaldo Lopez, Taylor Hearn, Jesus Luzardo and other Minor Leaguers (including two named below). Still, the system is loaded with talent. Washington's first three picks in the 2017 Draft (Seth Romero, Wil Crowe, Nick Raquet) restored some quality pitching to the lower levels. "When you think about how many [prospects] we've traded, especially on the pitching side, to be able to compete day-to-day is a testament to our depth," director of player development Mark Scialabba said. "Looking at our strengths, you see the athleticism in the outfield first, with Victor Robles, and there's Daniel Johnson and Blake Perkins, really dynamic players who can impact both sides of the game. And [there's also] the offensive potential of Juan Soto and [infielders Yasel Antuna] and Luis Garcia." Ankle and wrist injuries limited Soto to 32 games in his first full season, but the 19-year-old outfielder batted .351/.415/.505 with 10 extra-base hits. Along with Robles and shortstop prospect Carter Kieboom, he's one of three Nats on MLB Pipeline's Top 100 Prospects list. The strongest teams in the system this year played at the lowest levels, with the Gulf Coast League Nationals going 34-22 and Class A Hagerstown finishing 73-63. Catcher -- Raudy Read, Harrisburg (108 games), Washington (eight games): Playing at the Double-A level for the first time, Read hit 17 homers with a .312 on-base percentage while throwing out about 31 percent of would-be basestealers. "He has tremendous tools. He's a strong, physical young man who's growing into his body," Scialabba said. "He has power to both fields and exceptional power on the pull side. He understands how to call a game and manage a team." The native of the Dominican Republic played eight games in the Majors, and Washington honored him with the Bob Boone Award as the Minor Leaguer who best exhibits leadership, professionalism and other qualities consistent with "playing the game the Washington Nationals way." "What he did was understand what it takes to be a catcher, what that entails not only from the defensive side but on the mental side. He understands how to set up hitters, and you can see him wanting to be a leader on the field," Scialabba said. "He wants to play every day. He wants to be a big league catcher. His attitude, his perseverance, that's why he won that award -- all of those qualities resonated, and he showed everyone he's ready for the next step." Honorable mention: Taylor Gushue had a strong year at the plate and behind it in 91 games with Class A Advanced Potomac and eight with Harrisburg. He played in the Arizona Fall League. First baseman -- Neftali Soto, Harrisburg (67 games), Syracuse (68 games): Soto couldn't have headed into free agency on a higher note, having won the system triple crown with a .311 batting average, 24 homers and 82 RBIs across the highest Minor League levels. Second baseman -- Irving Falu, Syracuse (119 games): A veteran Minor Leaguer like Soto, Falu batted .280/.333/.406 with 29 extra-base hits in the International League. He also became a free agent at the end of the season, but the Nationals promptly re-signed him. "He knows what it takes to play at the Major League level and he knows how to hold his teammates accountable," Scialabba said. "He has plus makeup and he's a versatile infielder." Honorable mention: Austin Davidson got nearly as many at-bats as Potomac's designated hitter (171) as he did as a second baseman (184), but he finished ninth in the Carolina League with a .354 on-base percentage while totaling 33 extra-base knocks. Third baseman -- Sheldon Neuse, Hagerstown (77 games), Stockton (22 games), Midland (18 games): Neuse scorched with the Suns, posting a .349 on-base percentage with nine homers and 19 doubles until he was traded to Oakland in the deal that brought Sean Doolittle to Washington. Shortstop -- Carter Kieboom, GCL Nationals (six games), Auburn (seven games), Hagerstown (48 games): Kieboom brought a .405 on-base percentage into May 12, when a hamstring injury sidelined him through the end of July. He didn't cool down much upon his return, finishing the year with a .297/.393/.493 slash line. "He put himself in position to continue to progress and he was on a steep path and having success," Scialabba said. "He did a nice job hitting the ground running and making adjustments when [opposing] teams realized who he was and what he can do. "Certainly, he has the arms strength, the hands, the feet to play shortstop, and he's continuing to learn be more efficient in all parts of the game. His range is always something he's looking to increase, his explosiveness and quickness -- he's a young man with some physical development still ahead of him." Honorable mention: Yasel Antuna hit .301 in 48 games in the GCL in his debut season. Outfielders -- Victor Robles, Potomac (77 games), Harrisburg (37 games), Washington (13 games): Indisputably one of the game's top five prospects and the No. 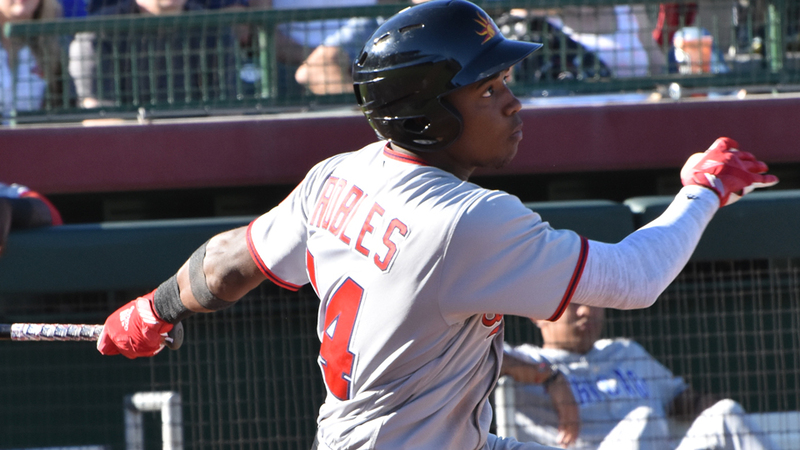 1 on the Nationals, Robles batted .300/.382/.493 with 10 homers, eight triples, 37 doubles and 27 stolen bases across two Minor League levels before swiping 11 bases in 13 big league games. Then he went to the AFL, where he was the Fall Stars Game MVP. "Victor's very passionate, a young man who's obviously very gifted, who can make an impact and play the game in all phases," Scialabba said. "What he was able to do was start thinking about game situations. We saw strides on the defensive side as much as anything -- the way he moves back on the baseball, improved his routes, his first-step quickness, because his closing speed is incredible. He has a strong arm and he continued to improve his accuracy. "He has that youthful energy that sometimes gets him in trouble, but we'd much rather that than have somebody that we have to speed up." Daniel Johnson, Hagerstown (88 games), Potomac (42 games): Johnson, a fifth-round pick in the 2016 Draft, put together an impossible-to-miss first full season, batting .298 with a .861 OPS. He belted 22 homers, added 29 doubles and stole 22 bases en route to a stint in the AFL and Nationals Minor League Player of the Year honors. "That was a tremendous Draft pick by [vice president of scouting operations] Kris Kline and his staff, and [Washington hitting coordinator] Troy Gingrich did a nice job helping him make adjustments to his swing, incorporating the lower half and getting synched up," Scialabba said. "Pound for pound, he's one of the strongest players in our system. He showed more of a patient-aggressive approach, getting into the mindset of getting pitches he can handle. "He had a very consistent season. He hit for power, his arm is well above average [like] Victor's and he has the speed to make an impact on the bases, too." Jose Marmolejos, Harrisburg (107 games): Winner of back-to-back Nationals Minor League Player of the Year Awards in 2015-16, Marmolejos was just as impressive playing in the Eastern League and moving into the outfield. He logged 183 total bases in 400 at-bats, slugging a career-best 14 homers. "He hits the ball to all fields, really drives it to left-center and he can pull it over the fence to the right side," Scialabba said. "We want him to be in the lineup in as many situations as possible. "We had him at first [base] and we played him a little bit in the outfield [early in his pro career], but we wanted to get him more exposure to left field to increase his chances of impacting the Major League club one day. We're proud of him for the way he handled that." Honorable mention: Blake Perkins led the system with 31 stolen bases while batting .255/.354/.378 in 129 games at Class A. He topped the South Atlantic League with 105 runs scored and 72 walks. Utility/DH -- Brandon Snyder, Syracuse (121 games): Snyder played three infield positions, two outfield positions and pitched in a couple games, but the 2005 first-rounder's bat is what earned him this spot. He posted a .456 on-base percentage with 23 homers and 24 doubles in 121 games with Syracuse. On Dec. 14, the Rays signed him as a Minor League free agent with a non-roster invitation to Spring Training. Right-handed starting pitcher -- Jaron Long, Harrisburg (13 games), Syracuse (14 games, 13 starts): Long's 3.61 ERA led Nationals right-handers who worked at least 100 innings, and he was fourth in the system with 114 strikeouts. The son of Washington hitting coach Kevin Long, he entered free agency with a 3.35 ERA in 109 games, including 88 starts, since turning pro in 2013. Left-handed starting pitcher -- McKenzie Mills, Hagerstown (18 starts), Clearwater (three starts): The Phillies' No. 21 prospect after a Trade Deadline deal, Mills went 12-2 with a 3.01 ERA and 118 strikeouts over 104 2/3 innings for the Suns, holding opponents to a .204 average. "McKenzie Mills is a projectable left-handed starter who really had a remarkable transformation this year," Phillies general manager Matt Klentak told the media at the time of the swap. Relief pitcher -- Wander Suero, Harisburg (18 games), Syracuse (38 games): Suero paced the system with a career-best 20 saves while finishing third in the IL with 31 games finished. Across two levels, he was 3-2 with a 1.79 ERA and a 2.09 opponents' average en route to Nats' Minor League Pitcher of the Year honors. "I think he's shown he's capable of pitching in the big leagues," Scialabba said. "He's got a fastball that generates a lot of swings and misses, with the late deceptive action of a cutter. His slider has improved and evolved over time and his changeup is a third pitch he's certainly been going to more often. He's got three weapons and his fearless attitude resonated throughout the year."